Need Help? Engraving Ideas for Corporate Awards Here! This entry was posted on January 23, 2017 by Jessica Anderson. For A Loss for Words, We Have Engraving Ideas! Need to order awards but not sure what the message should be? You want to recognize someone special, but just don't know where to begin. Below are ideas of text you can add to your Corporate Awards. 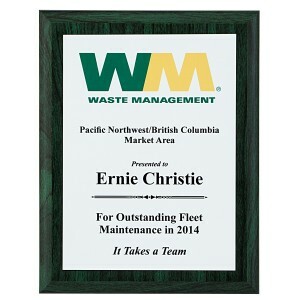 This sublimated plaque features the full color Waste Management logo with special message. Keep in mind that your recipient's award will be displayed forever; make your message stand out. Make sure it reflects what they are being recognized for. Keep it short, sweet and clever. Having a sense of humor is fine, but make it tasteful if you go this route. Read your text out loud before printing it on the gift. Wording will normally be centered, unless you specify otherwise. Include your company’s logo if possible. Use a motivational quote that is meaningful to your company or the individual. Here are a few wording examples for various types of awards. Failure is often determined by one's dedication. Earned you our highest esteem. WE WISH TO THANK FOR YOUR FINE EXAMPLE OF LEADERSHIP. YOU ARE THE #1 BOSS! MEET AND BEAT OUR GOAL! My most important tip? Spend some time on the wording, as this message will last. The recipient has done something wonderful for your company or organization. Make it meaningful. Speak from the heart.